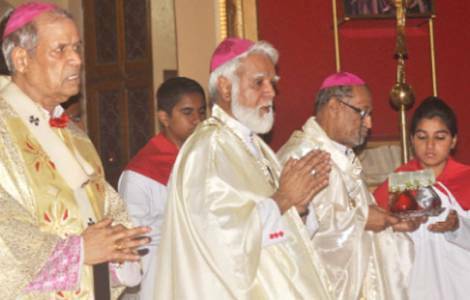 ASIA/PAKISTAN - The new Cardinal Joseph Coutts, promoter of inter-religious harmony: "Ready to humbly serve the Church"
Karachi (Agenzia Fides) - Catholics in Pakistan rejoice at the decision of the Pope to appoint Archbishop Joseph Coutts, at the head of the Archdiocese of Karachi, as Cardinal. The 72-year-old will be the second Pakistani Archbishop to be honoured with the position after the death of cardinal Joseph Cordeiro. Pope Francis will appoint him Cardinal on June 29, 2018, on the feast of the SS. Peter and Paul, in the Vatican. Cardinal Coutts told Fides: "I am shocked, but ready to humbly serve the Church and to continue to promote harmony in the city of Karachi and throughout the country". "In the Archdiocese of Karachi - he says - the faithful are increasing and many Catholics are settling in the suburbs and we are working with priests to build new churches and schools in the suburbs of the city". The Archbishop, who has chosen "Harmony" as his episcopal motto, has been working to promote dialogue and peace for forty years. He recently launched a diocesan commission for inter-religious harmony, to promote unity among people of various faiths, ethnic groups and nations in the metropolitan city of Karachi. Bishop Samson Shukardin OFM, Bishop of the Diocese of Hyderabad, welcomed the news and speaking to Fides said: "It was a long-awaited decision, a moment of joy for the whole Catholic Church in Pakistan". Bishop Samson notes that "Archbishop Joseph Coutts is the most experienced Bishop in the country and knows all the details of the work of the Church's mission in Pakistan". Fr. Qaisar Feroz OFMCap, Executive Secretary of the National Communications Commission, within the Catholic Episcopal Conference, reports to Fides: "Archbishop Joseph Coutts is well known in the country for his tireless efforts in promoting inter-religious harmony. It is a joy to have a Cardinal after such a long time. It will be useful for the growth and development of the Church".